Etia is situated between the Papagiannades and Armenoi villages. Doubtless the name "Etia" comes from the namesake tree (Itia in Greek means willow). Though the settlement already existed in the Byzantine period - as the Byzantine churches of St. John and St. Catherine indicate - it flourished at the time of the Venetian occupation in Crete (1204-1669), as a fiefdom of the Venetian family De Mezzo. The jewel of their estate is villa De Mezzo, which is considered among the most characteristic examples of the Venetian urban architecture in Crete. In the following years of the Ottoman occupation, it was used as the residence of the Turkish officials, and therefore named by the locals "Seragio-Saray". The first to mention that the villa of Etia was built by a rich and noble Venetian was the English Admiral T. B. Spratt, whose comments on his travels in Crete remain a valuable historical source from the mid-19th century. 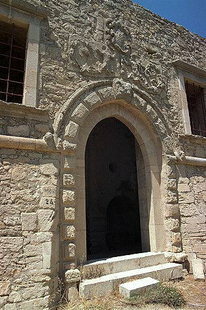 Later, the Italian archaeologist G. Gerola, links the owner of the villa with the members of the De Mezzo family. According to the genealogical records of the Venetian gentry there were three Mezzi in Sitia, Pietro, Nicholas and Giacobbe. Among them, Pietro dei Mezzo is considered to be the founder of the Etia estate and the owner of its villa towards the end of the 15th century. Right from the corridor, one enters a big, oblong hall, possibly the servants' dining room, while the small dark space on the left could be the cellar. 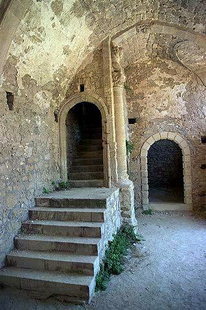 The antechamber also leads to halls with rib-vault, arched or vaulted ceilings and large windows facing to the yard. A small secluded room, that sticks out of the west wall of the villa could be a prison cell. Outside the megaron, just south of the courtyard, there were other vaulted apartments, the warehouses of the rich host. In the turbulent years of the 19th century Cretan revolts against the Ottoman regime, the villa suffered extensive damage and, as a result, the second and third floor of the building collapsed in ruins. Subsequently, abandonement and time came to fill the wear, until the villa was declared preserved historical monument and was restored by the Archaeological Service.